Mill has become a nationally-recognized figure in recent weeks after a judge sentenced him to jail for probation violations. Rapper Meek Mill paid for a Thanksgiving giveaway for local families today while still held behind bars. NBC10's Lauren Mayk shows us how supporters hope this draws attention to his case. Rapper Meek Mill's five-year tradition of giving out turkeys to his fellow Philadelphians continued on Thanksgiving Eve this year despite the lionized musician's controversial imprisonment. 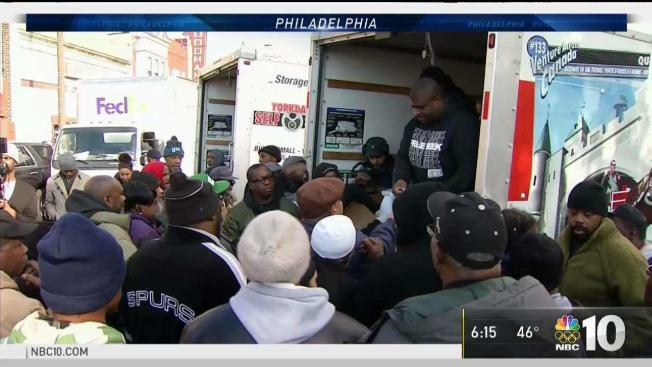 Mill, 30, began the holiday event in 2013 with the help of community leaders like South Philadelphia's Anton Moore. That first year, 200 turkeys were handed out at the Vare Middle School, as well as winter coats. This year, as many as 1,000 turkeys will be distributed at four locations throughout Wednesday morning and afternoon. The first batch of birds were given out at Moore's community organization, Unity in the Community, at Point Breeze Avenue and Dickinson Street, starting at 11 a.m. The giveaways were to proceed then at noon at Bible Way Baptist Church, 1323 North 52nd St.; 2 p.m. at Martin Luther King Recreation Center, 2101 Cecil B. Moore Ave.; and 3 p.m. at Strawberry Mansion Learning Center, Dauphin Street and North 30th Street. Dozens of Philadelphians wait for a free turkey from rapper Meek Mill outside Bible Way Baptist Church in the city's Parkside neighborhood on Wednesday. Mill, born Robert Rihmeek Williams, has become a nationally-recognized figure in recent weeks after a Philadelphia Common Pleas judge sentenced him to jail for probation violations. Activists and renowned musicians from Colin Kaepernick to Jay-Z have pointed to his jailing as symbolic of what they describe as harsh treatment of blacks by the criminal justice system. Julius "Dr. J" Erving and Philadelphia Eagles safety Malcolm Jenkins took part in a Center City #FreeMeek" rally. Kaepernick said in social media posts that he spoke with Mill in prison and said the rapper was "in good spirits." Jay-Z wrote in a New York Times op-ed that the Mill has "been stalked by a system that considers the slightest infraction a justification for locking him back inside." "Consider this: Meek was around 19 when he was convicted on charges relating to drug and gun possession, and he served an eight-month sentence," Jay-Z wrote. "Now he’s 30, so he has been on probation for basically his entire adult life." Mill's attorneys have filed appeals to Common Pleas Judge Genece Brinkley's sentence of two to four years in prison. Brinkley, who has overseen Mill's decade-long probation, has not made a ruling on the appeal. His attorneys have also asked that Brinkley recuse herself from Mill's case and any appeals. They claimed in court filings that the judge has expressed herself over the years "in personal, injudicious terms when ruling or explaining her rulings" in the ongoing probation hearings. The recusal request included some tawdry accusations, like a claim that she asked the Philadelphia-born rapper to record a version of a Boyz II Men song and include a shout out to Brinkley. Another claim accuses the judge of recommending Mill leave his management agency, Roc Nation, which is headed by Jay-Z, and rejoin his original manager, a Philadelphia man named Charlie Mack. In sending Mill to jail Nov. 6, Brinkley said Mill "does what he wants" despite repeated warnings. Twice in recent years, Brinkley ruled that Mill violated his probation by being associated with an alleged fight at a St. Louis airport and being charged with popping wheelies on a dirt bike in New York City.